I was lucky enough to take a trip to Easter Island, Chile, earlier this year. I had booked a flight from Santiago. Before getting there I imagined an old, small airplane. I don’t know why – but I had thought it would be a local airline with an old prop plane. The opposite turned out to be true: Latam is part of One World and operates a brand new Boeing 787 on the route to remote Easter Island across the south Pacific Ocean. Only during the long flight does it become clear how distant this place is. From mainland Chile you fly at a speed of 850 km an hour for about 5 hours! The island is almost halfway between mainland Chile and New Zealand. Rapa Nui from the air. We arrived in comfort. But now imagine that you are an early explorer, sailing the Pacific Ocean in search of new lands. After weeks of nothing but water, you spot land. A green island with round, cone-shaped hills and the odd ragged cliff dropping off into the roaring ocean. As this Dutch ship, under the command of Captain Roggeveen, cautiously approaches the island, furling the sails that billowed from its three tall masts, you spot people. Giants. Huge, towering people standing shoulder to shoulder with their backs to the sea. These stone giants are most likely meant to honour chiefs and other important people. For more than a thousand years – no one knows their exact date – they have been standing here, silently. 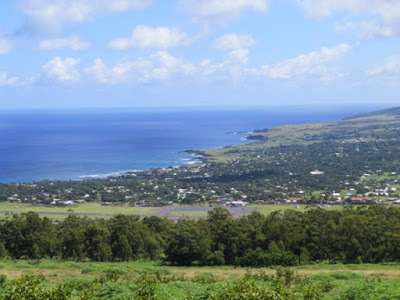 Only a few statues face out over the sea, looking in the direction of other Polynesian islands, possibly the Marquesa Islands from where the first inhabitants of Easter Island might have come by canoe. Roggeveen did go on land and communicate with the native population. 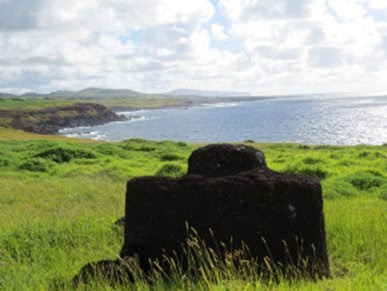 As it happened to be Easter for the European Christian sailors, they named the island Easter Island: Paas Eiland in Dutch, or Isla de Pascua in Spanish. 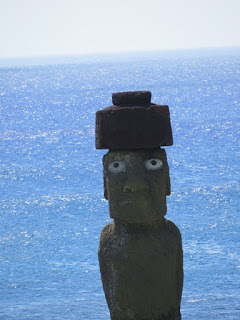 Never mind that the island already had inhabitants and a name: Rapa Nui. Like other islands claimed by European nations, it has now gone back to using and being proud of its original name and so I shall refer to Easter Island as Rapa Nui here. Since 1965 the island has been under Chilean governance. It uses Chilean pesos but has its own Rapa Nui postage stamps. The stone statues, for which the island is famous, are so shrouded in mystery that it is hard to realize that they stand on a normal island where regular people live in a regular town. I had only ever seen images of statues and green grass and found it slightly jarring to arrive in this mysterious place to see ordinary trucks, cola machines, dogs – just like in any other town. Where was the mystery? We walked across the tarmac to the palm-frond-covered entrance of a tiny airport. Each and every new arrival is greeted with a lei of fresh flowers. 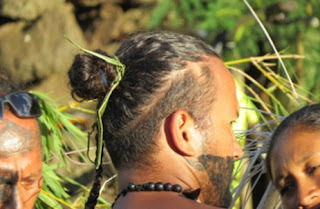 People here still speak Spanish but also Rapa Nui, which is very Polynesian and looks like Hawaiian to us. Rapa Nui is roughly the same size as Canada’s Salt Spring Island with almost the same number of people, around 7000 – increasing with tourists. They also face similar problems, such as sustainability, water shortages and recycling. Of course this island is much further away from a mainland. Supplies used to come, and still may, once a year by ship. Everything else is flown in. So the cost of a soft drink or anything else is sky high. A small bottle of water, which was 1 dollar in Santiago, costs 3 dollars here. Everything needs to be recycled or re-used. A sign in our bathroom asked us not to "throw paper at the toilet" – which we took to mean no flushing of paper. 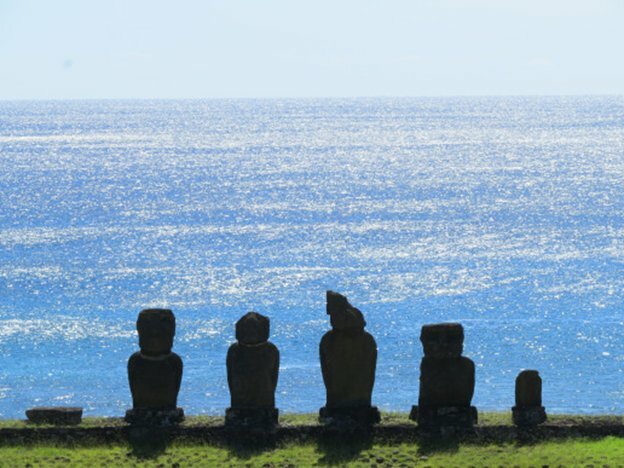 Our very first moai, or stone statues, was a row of five that, unlike all other moai, face out over the ocean rather than inland with their backs to the sea. Why? We can only guess and only “the ancestors” know the real answer. They sit near two platforms on which the moai typically rest. These platforms are built of huge square basalt blocks with straight lines and rounded corners. It is impressive how precisely these were constructed so many hundreds of years ago, without the use of metal tools. 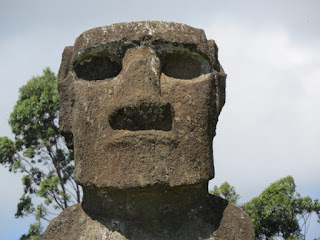 Once the guide pointed it out, we noticed moai that have fallen forward, on their faces, and cracked. Many were destroyed during a civil war between the Long Ears and the Short Ears tribes around 1680, as well as by missionaries, neglect and the passing of time. The standing, reconstructed moai are about 5 metres tall. Each face is quite individual. A few wear "top knots" – these round blocks of red lava have a smaller red part on top and are said to resemble not hats but hair, worn traditionally in a long ponytail tied in a knot on top of the head, just like most men here still wear it. All photos by Margriet Ruurs. You can find more of Margriet's travel stories at Globetrotting Grandparents.